"Pattan had to climb on the elephant to check on the pumpkin." A pumpkin taller than an elephant? An instant child-pleaser. 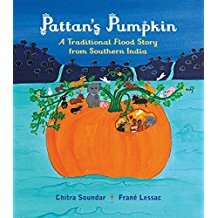 Chitra Soundar's word pictures are evocative: "The pumpkin grew a little every day. 'The goats can’t reach it now,' said Kanni. The pumpkin had grown taller than the fence. It was fatter than the pigs. It grew some more. Pattan had to climb on the elephants to check the pumpkin." This is a flood story with a twist. The 'ark' is a pumpkin large enough to accommodate Pattan, his wife Kanni, all the animals of the village, and all the bags of seed and grains. Why a pumpkin? Because Pattan did not have advance warning of the flood. One day ..."dark clouds gathered. Rain crashed against the rocks in fury. Pattan was afraid the rain would wash away his hut." What was he to do? The pumpkin glowed bright in a flash of lightning. Can you guess at Pattan’s solution dear reader? Frané Lessac's wonderfully detailed illustrations add depth and richness to the story. Jeweled blues and emerald greens. The mighty elephant dwarfed by the pumpkin.Kanni asleep, her mouth wide open. The blue of the raindrops on the orange pumpkin. Animals, (elephants too! ), on a delicate vine assembly-line carting out the pumpkin flesh. The background changes from bright skies to clouded darkness, to the purpling mountains, to bright skies again. From one hut in the foothills to a flourishing village, the story comes full circle. A most satisfying ending. A book that belongs in all libraries and book collections.